There is stress while being at university, finishing university and then the stress of finding a suitable job after graduating. Some people are lucky to get a job straight away in the field they studied in, however what about the people who are unable to? 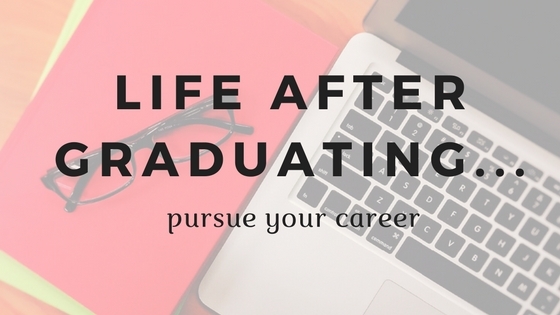 Today I will be sharing my story and how I dealt with life after graduation. While at University, I always had a job. Throughout the years I never stopped working as I didn’t want there to be a gap in my working history even though Education is a valid reason. I worked part time after university lectures in the evenings as well as weekends. This did not only help me with my financial needs as I had a car to pay for and a credit card, but work also kept me busy and gave me the opportunity to make some amazing friends! Another advantage of working while at university is that when you graduate your already in a job if there was nothing to come up. This is probably what helped me get out of a stressful position. When I graduated I was looking for jobs left right and centre with practically no luck. I was confused, unsure and undecided about what to do. I went to interviews after interviews and was offered jobs, however I knew those jobs were only going to be short-term as I didn’t have an interest in them. I could see myself going into depression due to all the stress, as I didn’t want to move back home, as well as I had rent and bills to pay. This is when I decided to look at what I already had and how I could make that even better. That’s when I realised I was already working for a financial company with a good pay so why not go full time and pursue my career in that field - baring in mind I didn’t do a financial degree. I decided to speak to my managers to go from part time to full time. As I already worked part time for this company for a year and a half while I was at university I already knew how my job role worked. When I went full time I wanted to move up the ladder and to my surprise I was given that opportunity. This made me reflect back on my life and made me realise this was the way it was meant to be for me. I was stressing for no reason when I had the perfect opportunity in front of me but I was looking past it. I suppose it’s the pressure of making use of my degree. Let’s not forget a degree is something no one can ever take away from you, even if the degree isn’t related it can still be useful in many other ways. Some companies don’t mind what degree it is because they know there are many skills which the person will have acquired during their university life. That’s my story, yours maybe completely different. However to all the graduates who are stressing about a job, just look at the job you may currently have and see if you can pursue your career in that, from sales assistant to sales team leader or assistant manager and so on...it’s the experience that matters so once your in the new role and know how it works then apply again to work for the company of your dreams. If you are not in a job then do voluntary work, for example the NHS has opportunities available, once your working for an organisation it’s easier to find a permanent role in that place as you would of done their mandatory training and would already have the experience of how that organisation works. Make 2018 a stress free year!! Appreciate what we already have and remember nothing is to be taken for granted. What’s today may not be here tomorrow!